A sheriff in Arizona came up with a way to save tax-payer dollars while at the same time potentially improving the diet of inmates/degrading their quality of life in a way that passes Constitutional muster. 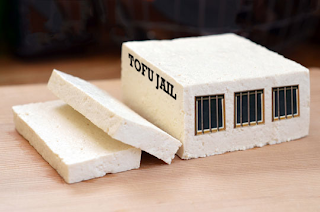 He recently began converting the jails’ meal options to vegetarian-only. The meat in meals like beef stew will be replaced with soy products, and the “meatloaf surprise” is now even more so. He will gradually convert the menus for each of the eight jails in his county to all-vegetarian meals. The jail system is, by some accounts, the third largest in the country. It includes about 8,300 inmates who get two meals a day. Despite this seeming like a health conscious or environmental move, the five-time elected sheriff has said it is all about cost savings for the county. Rising food costs have been a big concern in recent years, with budgets for the corrections department continually being stretched thin. He estimates replacing the meat for soy will save tax payers $100,000 annually. The prisons currently rely heavily on donations from food banks and other charity organizations. For many inmates, having to spend time in a tiny cell all day with Bubba is bad enough, but having meat taken away as well? If this vegetarian policy spreads, maybe it could become another deterrent for people to stay on the path of the straight and narrow. They should be happy that they are not getting bread and water!